Calcagno Cullen stays busy as executive director of Wave Pool, the Camp Washington art center she and her husband Skip opened in February 2015. There was the FotoFocus installation by Dutch artist Pierre Derks that they staged outside of the Freedom Center in early October—an igloo-like inflatable white dome filled with TVs running footage pulled from unsecured webcams. Then there was that live stream of Washington, D.C.’s Creative Time Summit, a discussion of the intersection of art and social justice, that they showed at The Sanctuary in Lower Price Hill. And in between: a lot of programming in their gallery space. 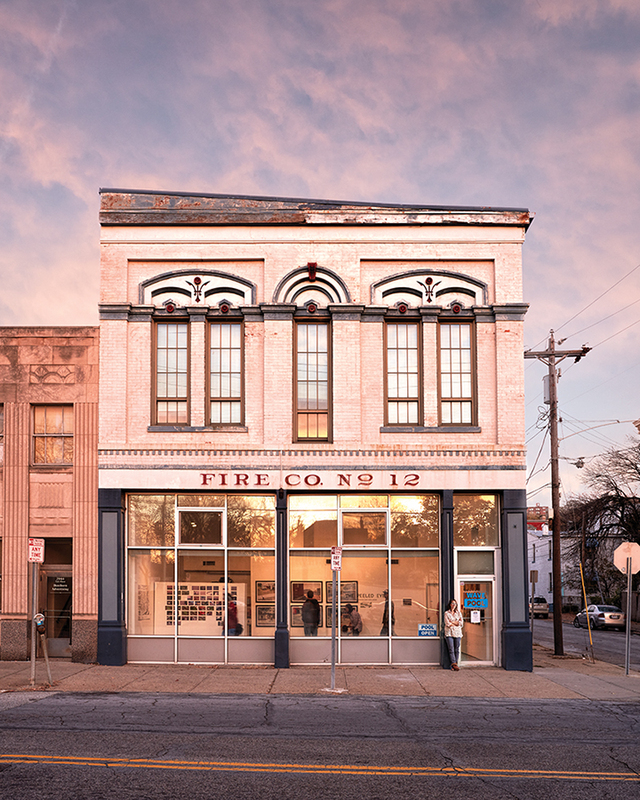 As the city’s bohemian culture dissipated and the cost of living skyrocketed, the couple was drawn back to Cincinnati, this time with a clear mission: Fill the void for a community-based, contemporary, cutting-edge art space that supports artists. And do it in a way that elevates the Cincinnati art scene, showing local artists alongside those respected nationally and internationally. And have artists in residence. And contribute to the community in a serious way. And, and, and…. Wave Pool has attracted artists in residence from across the country with projects as varied as hosting personal change “groundbreaking ceremonies” for residents of River City Correctional Center and organizing glass-making workshops using dirt, lime, and sand found around town. They rent out studios. They’ve showcased the works of photographer Mishka Henner and conceptual artist Paolo Cirio alongside local artists like Andy Marko. “It brings those people to Cincinnati for us to enjoy, but [also] brings our local artists out into the world and puts them on the same plane. That’s really important to us,” says Cullen. Wave Pool also maintains its upstairs gallery as a community-driven space, à la Adobe Books. Cullen has a ready list of ways to further those initiatives, too: increase funding for residencies; expand into live/work housing; open a storefront for refugee-made goods; and be a contender for significant grant funding. They’ve already started a corporate loan program by curating work for bare-walled businesses, making the gallery and the artists some money in the process. Previous articleWill Tom Ford’s Film Induce Austin Wright’s Literary Rebirth?